Mother’s Day, named a national holiday in 1914, had a nearly 60-year jump on Father’s Day, which wasn’t formally added to the calendar until 1972. It’s now a virtual given that breakfast in bed belongs to moms while dads man the grill. Why not shake things up this year? Host a Father’s Day backyard brunch. You grill, Dad grills, or you happily share the cooking responsibilities. Then spend a leisurely afternoon doing something you know he’ll enjoy. Here are some menu suggestions (including manly steak and eggs) to get the party started, some accompanied by our terrific new videos. Happy Father’s Day to all the dads in the Barbecue Bible community! You could opt for classic Bloody Mary, but sangria, made with either bubbly white Prosecco or red Lambrusco, is a lighter, more summer-centric beverage. Colorful citrus fruits are crusted with sugar, caramelized on the grill, then muddled with rum and sparkling wine. This is a perennial favorite at Barbecue University. By the way, if you’re still agonizing over a gift for your father, give him an IOU for BBQ U 2019. It’s three days of food and fun that he’ll never forget. Dates will be announced soon. Since the release of Project Fire (Workman, 2018), we’ve been obsessed with cooking breakfast on the grill. (Yes, the book has a chapter devoted to the first meal of the day.) 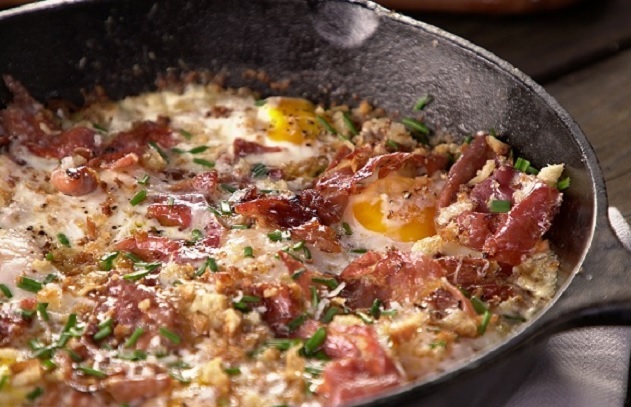 This dish, baked in a cast iron skillet, is especially brunch-worthy. It may seem counterintuitive to grill lettuce, but crunchy romaine gets a quick turn on the grill—just long enough to pick up some smokiness. And the dressing, which can be made ahead of time, is piquant and umami-rich. Alternatively, offer a platter of fresh fruit. Slices of pineapple, watermelon, and cantaloupe look and taste even more appealing with grill marks. “Cavemanning,” a word Steven coined to describe food that is cooked directly in the embers of a charcoal or wood fire, is a dramatic technique that works well with thick steaks or chops. And what better time to break out the porterhouses than Father’s Day? (T-bones, which are slightly smaller, can be substituted. Just make sure they are thick—at least 1 1/2-inches.) While the meat rests, colorful peppers are sautéed with garlic and cilantro in a cast iron skillet. Bacon, smoked cheese, pimento (smoked paprika)—not to mention wood smoke—make these spuds, well, smoke bombs! They can be made in advance and reheated the day of the party. If Dad’s a chocoholic, you must make these decadent s’mores. For an “adult” version, brush the tops of the brownies with bourbon before topping with chocolate, cooked bacon (after all, what’s brunch without bacon? ), and marshmallows. If you don’t own a salt slab, use a plank or a plancha.